Made in the USA! Available in 12 fl. oz. bottles. 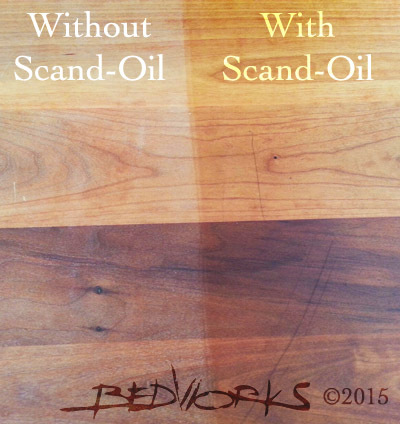 Scand-Oil is a comprehensive wood care product designed to clean, polish and protect. It is formulated from U.S.P. and food grade oils and is sandalwood-scented. Scand-Oil is non-toxic and is packaged in attractive unbreakable bottles. Scand-Oil is safe to use on children´s furniture and is not harmful to pets. Scand-Oil is as pleasant and easy to use as hand lotion. 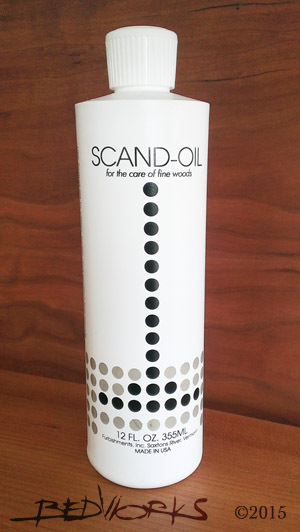 Scand-Oil is used for bowls, carvings, clocks, frames and wooden-ware. This product is most often used by owners of fine furniture and cabinets. We also supply Scand-Oil to maintenance services, museums, furniture refinishers, boat-owners and to institutions such as banks and corporate businesses for the care of office furniture and wood paneling. "I adore my couch! The month I've had it has been the most comfortable month since I moved to Boston! I can't wait for my matching chair! Thank you!!"